Girl Scouts of Alaska is the premier leadership development program for girls in Alaska. Girl Scouts provides a safe, inclusive environment where girls of all ages from diverse backgrounds develop the courage, confidence and character to become leaders and make the world a better place. Learn more at www.girlscoutsalaska.org. Leadership is a word we hear a lot in Girl Scouting. For 100 years, Girl Scouts has been helping girls discover, and fulfill, their leadership potential. Yet how often do we have conversations about leadership -- especially the sometimes sensitive issues around women and leadership? So, on the afternoon of February 7, 2012, that's exactly what we did. Girl Scouts of Alaska invited the members of "Troop 49," an honorary Girl Scout troop comprised of Alaska's women legislators, commissioners, and the first lady, to join a small group of Juneau Girl Scouts for a dialogue about women and leadership. Rep. Anna Fairclough speaks, as Rep. Berta Gardner and Rep. Tammie Wilson listen. Then, the Girl Scouts were given a chance to weigh in, responding to questions such as "What do you think it takes to be a leader?" with answers like "courage" and "determination." Juneau Girl Scouts listen intently as members of Honorary Troop 49 share their perspectives on leadership. In addition to the enthusiasm of the participants, and the heart-felt advice given by the members of Troop 49, what struck me as most interesting about the conversation was the girls' response to questions about access and opportunity. When asked if girls and boys have equal opportunities to become leaders in our country, every girl in the room agreed without question that yes, girls and boys do have the same opportunities. That was encouraging to hear. But, one girl noted, our country has never had a female President. And, another girl observed that there aren't any women candidates for President, either. That's when a parent clarified that there are women candidates, but perhaps we don't hear about them because the media treats women differently. The legislators chimed in to share specific examples of how the media often focuses on a woman's appearance, rather than the substance of her remarks. This prompted a Commissioner to note other challenges women can face in achieving positions of leadership -- and not just in politics. For example, men often have access to social networks and mentors, and women aren't always included. Both adults and girls were so engaged in the discussion that time passed quickly and everyone seemed disappointed when it was time to go. The room was still buzzing with excitement as everyone gathered in a friendship circle, then posed for a group photo. Before leaving to return to their busy lives as leaders, the members of Troop 49, along with the other adults in the room, signed the ToGetHerThere pledge, a commitment to become informed, to speak up, and to invest in girls. 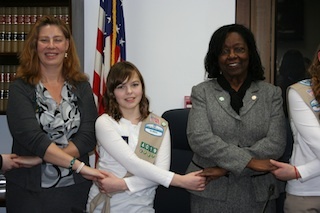 Already, Troop 49 members' willingness to attend the event and speak so openly with girls has made a difference. Because, as we know in Girl Scouts, sometimes the real lessons aren't the ones that you can talk about or put into words. Almost every legislator referenced the things that helped them get where they are today -- the support of a parent or a friend, the encouragement of a mentor, or the simple presence of a role model to look up to. Now they in turn are serving as role models for today's girls to look up to. Girl Scouts of Alaska is eager to organize more events like this around the state during our 100th anniversary year, and beyond. If you want help organizing an event with women leadership role models in your community, please contact Marge Stoneking or Anne Gore at the council office (907-248-2250). Who Says Girls Don't Like Science?